This is a photographic print of 22 Park Place, Brighton. 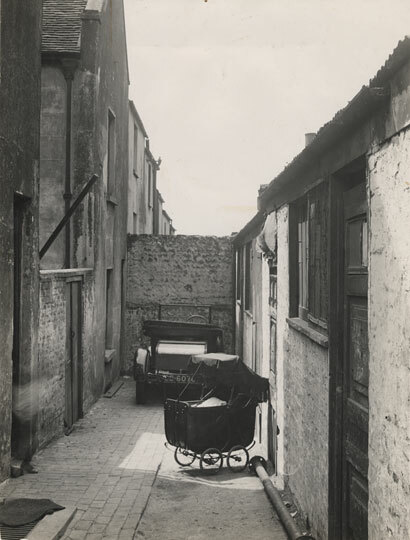 It shows a courtyard at the back in which a pram and a motor car can be seen in front of a stone wall. A blurred figure can be seen stepping into the property on the far left of the photograph. This photograph was commissioned by the Environmental Health department of Brighton Borough Council. It forms part of a visual record of areas considered for slum clearance. Like many streets in the surrounding area, Park Place was demolished in the late 1930s. My dad, George Harold Sullivan, was born at No.7 Park Place in 1918. His mother’s name was Mary Ann Sullivan (born 1895) and she worked as a ‘rag sorter’ which sounds like a poorly paid occupation. According to some of my family history research, there were a number of Sullivans in the area around Park Place. I remember my dad talking about the ‘slums’ and the poor living conditions with no electricity, shared toilets and no bathrooms. My great grandparents lived at No. 4 Dennis and Sarah Sullivan with their children in 1911. I also had relatives in Lower Park Place at No.11 and No.15 during 1911 as well. My 2x Great Grandfather, David Nutley b1840-1917, lived at 16 Park Place with his wife Mary Ann (Parker-Harris) b1839-1914 and children Charles Nutley, Mary Ann Nutley and Horace Valentine Nutley, according to the 1871 Census. They had another child Harriett Kezia Nutley who died in 1868. My Great Grandfather, Alfred Squire Nutley, was born in 1871 so was probably concieved here. Some claim to fame! My grandmother lived at 20 Park Place, Brighton, Rebecca Stanford. If anyone has any information about my family please contact me. Hi, Martina: My latest book “The Secret of Banjo Groyne: Innocent and Sentenced to Hang. The True Story of the Brighton Murder of ’28”, (available from Amazon), contains plenty of information about Rebecca Stanford’s life at Park Place. What a great photo. Is it only Royalty that use prams now? I think perhaps the blurred figure is actually stepping out from the property, as the toe end of the person’s shoe is pointing outwards from the step. I had to check this in my copy of The Encyclopaedia of Brighton. Park Place used to run roughly northwards from the old Vulcan Tavern, on the corner of Edward Street, up to the eastern end of Carlton Hill. It was between Mount Pleasant to the west, and Egremont Place to the east.